Werewere Rakuraku - the son of Tu Paiaka and Putiputi Rakuraku. Born August 24th, 1923 and raised in the Waimana Valley within Te Urewera. He’d had three months with the Homeguard at Matata and signed up at Avondale to serve with the 28th Maori Battalion in May 1944. He was 20 years and 8 months old and only 5’4”. He passed the medical with a Grade 1 health rating. Not surprisingly, Werewere couldn’t ride a motorbike but he could ride a horse! At the time of enlisting Werewere had been living in Auckland and working at Southdown Freezing works. Not long in camp at Papakura and Trentham and Werewere was off to war with the 12th Reinforcements. His nephew Paora Rakuraku was with him. They both left Wellington on the HMT Highland Princess on June 29th, 1944 arriving in Port Tewfik, Egypt on August 2nd 1944. 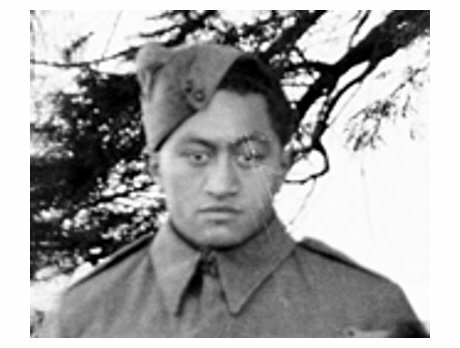 He was marched into the NZ Maori Training Depot at Maadi on August 8th, 1944. He celebrated his 21st brithday there as well. While there he also got in a bit of trouble for causing a disturbance and for failing to carry out a lawful command by his superior officer. He had to forfeit 10 days pay for that. A month after turning 21 Werewere was embarking from Alexandria for Italy and was posted to B Company of the 28th Battalion (NZ Maori Inf Corp) on 26th October 1944. It looks like he got his first taste of battle in October while the Battalion was in Northern Italy. Less than two months later Werewere was killed in action on December 16th, 1944. The details of his death are not fully known. However, Stuart Black (Tai Paraki), a whanaunga who served with him told his mother Putiputi that Werewere died by the river - the Senio flows through Faenza. Stuart was with him when he died and returned Werewere's belt to Putiputi. Werewere had no children, but he lives on in the whanau through his namesakes – Werewere and Tahawai. The event of his death is remembered in the latter name Tahawai, given to Werewere’s niece by his mother Putiputi. Werewere is buried at the Faenza War Cemetery, Italy. Moe mai ra e te Papara. E kore tatau e warewaretia. Further information and copies of this image may be obtained from Te Papa through its Collections Online website. Permission of the Museum of New Zealand Te Papa Tongarewa must be obtained before any reuse of this image.